The thing that bothered me the most is not that DFI chose to go with a passive heatsink to cool the KT400 chipset, rather that they attached the heatsink with thermal glue! If the previous VIA KT chipsets are any indications, the KT400 will get quite toasty when in operation, and it would have been nice to have some better form of cooling on the Northbridge. I'm not sure why DFI had to include so many little blue jumpers. Couldn't they just incorporate things like 100/133/166 MHz FSB adjustments in the BIOS? The ATX power connector is to the right of the CPU socket and just on top of the AGP slot which will interfere with the CPU fan but I understand that this supplies cleaner voltages to the MOSFETs. I'm sure you all know my feelings towards AC'97 based sound cards. If you'd like a bit of information on the VIA KT400 chipset, please read our MSI KT4 Ultra-FISR review. Another thing that we were happy to see was that DFI has included the four surrounding mounting holes even though AMD has taken them off their requirements list. 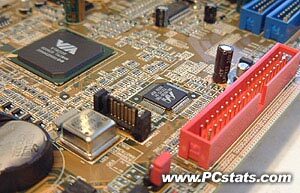 There is a good amount of space around the CPU socket so you shouldn't have any problems installing larger heatsinks like the Alpha PAL8045. DFI have been focusing on areas which don't always mean that enthusiasts get what they would call "overclocker friendly" features and tools. There is a lot of competition in the relatively small enthusiast market, so this doesn't always make too much sense from a manufacturers perspective - but since enthusiasts are often gammers, the two do go hand in hand on some points (performance namely). We were pleasantly surprised to see how many overclocking options the AD77 Infinity had, perhaps DFI are going to be focusing more on overclockers this year as a price war is expected to hit the motherboard market shortly. We ran into some weird problems when it came to overclocking the AD77 Infinity however. With the original BIOS the board was shipped with we had no problems running at 190 MHz FSB - however once we flashed the board with the latest BIOS, we could no longer overclock. The options were still there, but the board simply refused to boot into Windows if we ran the board at 5 MHz FSB higher then stock (166 MHz FSB was our starting point since we're using an AthlonXP 2700+). We're not really sure what the problem was and every time I tried flashing the board back to the original BIOS, it would just hang. This may have been isolated to the board we received for testing, and as we already mentioned, with the BIOS it shipped with overclocking was fine. DFI got back to us why we lost our overclockability when we updated the board with the latest BIOS. Basically they're trying to protect newbie overclockers from killing their processors or damaging the motherboard. If you feel you're experienced enough in the "art of overclocking" you can e-mail them and they'd gladly send you the overclockers BIOS.